Timeline of the history of KaukoInternational Oy Ltd.
KaukoInternational expanded to Central Asia. A daughter company, KaukoInternational Central Asia, was established. Read more. 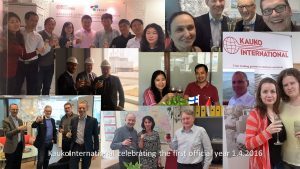 KaukoInternational celebrated its first year in business. KaukoInternational Oy Ltd. was established by management buyout. Kaukomarkkinat sold its industrial business to KaukoInternational. Kaukomarkkinat became part of the Aspo entity. A regional office to Russia was registered on July the 4th 2007 by Kaukomarkkinat. Representative office in Vietnam was established by Kaukomarkkinat. In 2002 the office expanded to industrial business, and gradually solely to pulp and paper industry. First offices to China and Indonesia were established by Kaukomarkkinat. The industry business of KaukoInternational was part of the Kaukomarkkinat combine for 68 years until it became its own company.